It seems that the buzz in blogland is Christmas, it's impending arrival, and the crunch to get gifts made. This year I'm planning on a huge king-size Christmas quilt for my husband and I. I spent the better part of yesterday cutting many, many strips for my first log cabin quilt. There is something about the feel of fabric in your hands during the quilt making process. It feels like hope and promise to me. There is an excitment in a swatch of fabric. The possibilities are endless. 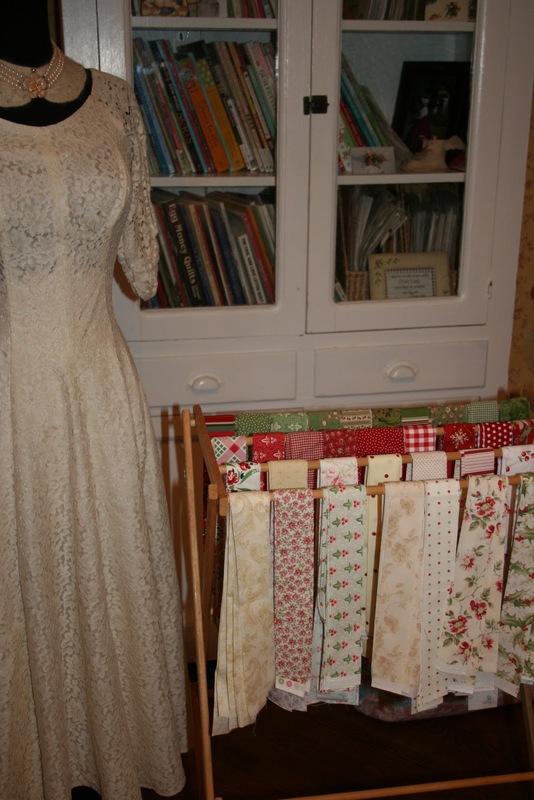 The strips of fabric look like a work of art to me, all lined up on the vintage drying rack, ready to go. The last Christmas quilt I made was this snowball quilt. I have collected Christmas novelty fabric for years and wanted something colorful and fun for the family room. This quilt is loved so much that it stays out all year long. I am drawn to retro Christmas images. They remind me of being little again and how much I've always enjoyed the Christmas season. There is talk of snow here in Michigan today. The air is crisp and cold. Good quilting weather! I am joining Joyce at I love pretty little things for Friday Pretties and Dayle at A collection of this and that for the Airing of the Quilts. Happy Friday everyone! Wow, Renee...you did some cutting today. I agree with you, there is something so promising about starting a new quilt. Maybe that's why I'm so much better at starting than finishing. Love you retro snowball quilt,too. What an undertaking, Renee. I am certain it will turn out lovely! I jut love the feeling of fabric too...and all it's possibilities! Christmas holds fond memories for me as well. Spending time with my cousins on Christmas Eve, sugar cookies, laughing, and bows on Uncle Chets head! I have Christmas quilts for our beds, and I put them out every year the day after Thanksgiving. They stay on the bed until the end of January. This will be a beautiful quilt. You are my new hero for wanting to sew a king size! You're going to be as busy as I am with sewing. I like how you put your strips while they wait to be sewed. I love the fabric...and we did have a bit of snow mixed with rain yesterday, perfect for sewing or knitting. I envy your quilt making talents! I too LOVE the retro Christmas fabric, so hard for me to find in my small town! Gorgeous Everything!!! Wow, a king-sized quilt? You are my quilting hero! She is featuring a great new magazine. I WANT!!! That is a lot of cutting! It is not even my quilt...but I got so excited just looking at that pretty fabric hanging there. :) I know is it going to be just beautiful. I love retro Christmas fabric to! I heard about that snow word as well. UGHHHH!! So glad to see your quilt through Airing the Quilts...your work is so beautiful!! Christmas quilt...have fun...and I can't wait to see the end results! Renee, what a wonderful post. I love the title, "Strips of Promise." I remember my mom telling me how excited she gets when she picks up new fabrics. I can't wait to see your finished product, and the snowball quilt is just adorable. Thanks so much for joining the party today. Always a pleasure to see you. Strips of Promise - what a wonderful viewpoint! But you have your work cut out to finish that before Christmas. I have yet to make a Christmas quilt, because I'm not sure I could bear to put it away after the holidays. Glad you posted at Airing the Quilts. Happy quilting,,,and happy "pretty" Friday! Your snowball quilt is lovely. I hope you finish your new quilt in time for Christmas. All your fabrics look great on the drying rack...very organised! Will look forward to seeing your quilt come together. I love the retro Christmas images. They are my favorite!! We actually had some frost and freezing of some rain water last night...thats cold for here in south Alabama!! Hi Renee, Love the fabric strips. I'm finishing hand quilting a strip pieced Autumn quilt-hopefully it will be done this weekend so I can enjoy it for a few more weeks. Two years ago I made my hubby a flannel Christmas quilt that he uses all year. Happy sewing this weekend. Your quilt is beautiful. I look forward to seeing the one you are starting when it is completed! The retro fabric on the snowball quilt is just wonderful. I'm going back to your post again, just to gaze upon it some more. Wow, I have to agree with you....having the fabric hanging on the drying rack looks just beautiful! And, I know how you feel about cutting the fabrics for a quilt. It's such a wonderful thing! I joined in on The Airing of the Quilts, too, and I am so glad that I did and found your blog. It's just beautiful and I will be visiting often! I love our Christmas quilt, and I'm envisioning the finished log cabin Christmas quilt in my mind, and love the idea of it! I've never quilted, but bought material a while back with big plans of making one...I've just been too intimidated to start! Seeing all those strips of fabric lined up on your drying rack was very inspiring, and now I want to start!